St. Helena Island native Sam Doyle lived all of his 79 years in the Lowcountry of South Carolina where Gullah culture teeming with Afro-Caribbean influences emerged from the diasporic firmament of slavery. As a child, he absorbed ancestral lore from his elders and attended Penn School, established by northern missionaries during the early days of the Civil War to provide educational and vocational training to those newly liberated. Though family hardship forced his withdrawal, at Penn he learned the value of history and first received encouragement for his artistry. By 1927, bridges linked St. Helena to Beaufort and the islanders to mainland employment opportunities. Doyle found work there himself and commuted for several years before relocating. During his off-island residency, he met his wife-to-be, Maude, married, and parented three children. In 1943, much to the disfavor of his more cultured spouse but heeding Gullah tradition, Doyle moved his family to St. Helena. They settled into a modest two-story house nestled on a few acres of ancestral farmland. World War I1 was then at full flame, and his marriage was failing. (Because of a childhood foot injury, Doyle was classified "unfit" for military service, which he later confided was the low point of his life.) Hoping to unify his family, he built Maude's Shop adjacent to their house. His wife and children sold refreshments to youngsters who played sports at the nearby sandlot field. He painted a roofing-tin portrait of a bald eagle, the mascot of the community's baseball team, the Wallace Eagles, and placed it in his front yard. After the couple's tempestuous marriage was officially dissolved, Doyle moved into a ramshackle structure behind the family home and lived there quite uncomfortably until his children graduated from high school. Perhaps to atone for his lack of military service, he took a job in the laundry at the Marine Corps Recruit Training Depot on Parris Island. Arrangements were made with relatives so the children could attend college elsewhere in the state, and his wife, following the lead of many of the Lowcountry's African Americans, resettled in the Northeast. Doyle's outdoor gallery was in its embryonic stage. A portrait of boxer Joe Lewis joined the Wallace eagle, and with no particular plan Doyle added more artworks to his display. "You know," he told National Public Radio in 1983, "I'll be in my bed and I just say I want to paint something, like people I've known a long time ago and stories that I have been told." Though not yet signified, themes emerged: patriotism, faith, history, and achievement. Doyle was fond of saying "That's natural, man!" St. Helena was a "natural" place, a peaceful place filled with mystery and intrigue where one's imagination was encouraged to contribute. The painter immortalized many of the island's legendary denizens in paintings such as Dr. Crow and Rocking Mary and gave shape to the unseen phenomena of his youth in Old Hag (who sheds her epidermis and rides her victims to misery) and Jack 0 Lanton, the fabled nocturnal angler, who with spear in hand fishes in ditches and stuns his unsuspecting prey by shining a light from his derriere. After his retirement, Doyle evangelically committed to "painting history." With bold strokes and vibrant colors, he blended ancestral Gullah lore and his devout Baptist faith into a rich multicultural impasto. Two series, Penn (school) and First (achievement or event), commingled with his folkloric works and clearly established Doyle's mission to honor Gullah culture and, more generally, African American advancement. Through the years, the museumlike display that overflowed the yard of his small, two-story house and adjacent workshop evolved into the St. Helena Out Door Art Gallery. Doyle created art on all manner of surfaces but much preferred the smooth surface of metal, and his long fluid strokes reveal his affinity for the tactile nature of his craft. Often, he painted the background around his subject, contouring the figure as he worked. This overlaying of paint created a discernible aura that added considerably to its presence. He resolutely defended the works in his outdoor gallery from the harsh climatic extremes of the Lowcountry. Virtually all of the artist's older works show signs of rejuvenation, some were nearly rebirthed by their imaginative creator. 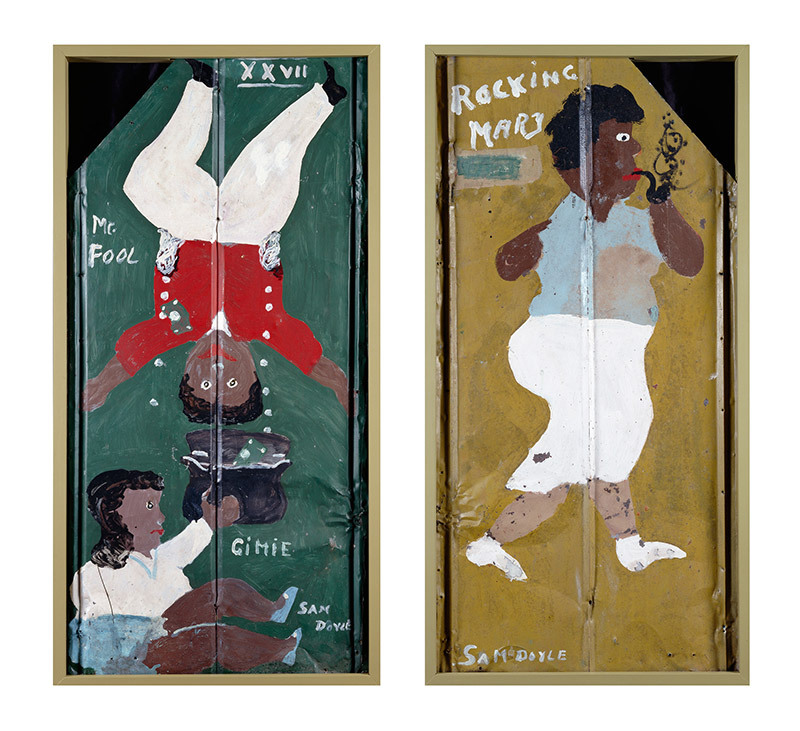 Doyle's uniquely styled personal portraits and tributes brought him much acclaim, particularly after his inclusion in the Corcoran Gallery of Art's seminal 1982 exhibition Black Folk Art in America, 1930-1980. Aficionados traveled from around the world to view his outdoor history lesson. He commemorated many of their visits by painting their hometowns or countries of origin on a 4 x 8 foot plywood Visitors panel, and he amended his gallery sign, adding "Nation Wide" parenthetically to emphasize its broad appeal. The Washington, D.C., event was Doyle's only excursion away from his home state. He had the sublime pleasure of seeing his artworks formally presented and shaking the hand of First Lady Nancy Reagan. Flush with patriotism, upon his return he refreshed a number of his artworks with red, white, and blue house paint, bathing some of his favorites, Rambling Rose, First Black Midwife, and Penn Roser House, in the patriotic hues. As evidenced by his Visitors sign, Doyle's influence is far and wide. The late neoexpressionist Jean Michel-Basquiat once traded some of his own artworks to a gallery owner for a few of Doyle's, and noted contemporary master Ed Ruscha, who has cited Doyle's "strong effect on me," paid posthumous tribute to the artist with his painting Where Are You Going, Man? (For Sam Doyle), 1985. The work now resides in the collection of Eli Broad. Public collections include the High Museum of Art in Atlanta, the American Museum of Folk Art, the Dallas Museum of Art, the New Orleans Museum of Art, the South Carolina State Museum, and the Smithsonian American Art Museum in Washington, D.C. Source: Bailey, Gordon W. "Sam Doyle," in The New Encyclopedia of Southern Culture, Volume 23. eds. Crown, Carol and Cheryl Rivers. University of North Carolina Press: Chapel Hill, 2013. 264–266.